We would like to be the first to admit that we could not meet our hundred percent resolutions we made for New Year 2013; however, we tried our best to achieve the target. The reason and concept behind making these resolutions is setting a goal and working toward it and holding ourselves accountable at the end of the year. We feel proud sharing that we successfully achieved more than 50% of what we set as a goal in 2013. We successfully advocated the rights of excluded, disadvantaged community, religious and sexual minorities, made efforts in defending human rights defenders, women rights defenders, lawyers, and community. We raised the issues of Children and community affected by the disasters at both national and international forums. We successfully raised the issues of Urban refugees at national and international forums. We also raised the issues of sexual and religious minorities and used legal tools to defend them. In education, skill development, and networking we educated young, mid career and senior human rights defenders, monitored their security situations, and provided them technical support in designing their security plans and linking them with local, national, and international resources. We supported the positive initiative of STATE initiatives genuinely made for the people and community, supported the struggle of other civil society actors, assisted CBOs and WOs in their initiatives and provided legal support to them and communities. We introduced refugee law, anti sexual harassment law, statelessness in law courses informally and struggling to make it part of syllabus officially. We struggled, and supported the initiative and struggles of journalists and lawyers for media freedom and independence of judiciary and educated lawyers on law reforms, rule of law, general principles and persuasive laws and mobilized them on their role in administration of justice and independence of judiciary. We encouraged legal bar association to promote and protect human rights and play strong role in addressing common people’s issues. We successfully trained hundreds of police officials (regular and prison) on human rights, rule of law, rights of refugees, and religious and sexual minorities. We welcome New Year 2014 with open mind, heart and resolve to work hard for the people, society, country and international peace and stability. Helping others, standing for right and standing with helpless people and raising voice for them is our first resolution. Strive hard for making difference in the society which ultimately benefit common people and bring positive changes in their lives. An additional resolve that even if we fail, we will still continue to strive until we achieve the goal. We will be monitoring human rights situations, security of human rights defenders, building capacity of lawyers, journalists, women organizations and youth in the New Year. We will further promote team work, coalition approach in work and elsewhere. 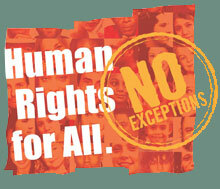 We will introduce ONE YEAR COURSE in Human Rights and will start a campaign for ending immunity and impunity. We will promote the International Criminal Court in Pakistan, South-Asia and at international level. We will continuously promote the approach: understand each others’ point of view and respect differences. Finally we close this, with the poetry of Shah Abdul Bhittai, whose always focus the themes of peace, harmony and mutual respect and pray a sustainable, non discriminatory development and human rights for all. We wish happy New Year 2014 to all of you and pray for peaceful transition from 2013 to 2014.